Koth romance. Time to dish the dirt. I am seriously regretting getting involved with this loser. 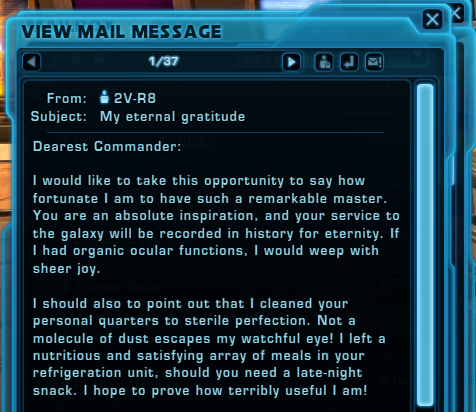 I also got a thank-you note from my ship droid which was slightly less whiny. Maybe I should date him. 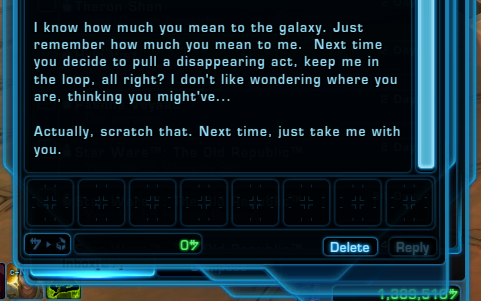 I’d never thought I’d see the day that the boot-licking Ship Droid is less clingy than a romance option. Oh, Koth, you never fail to make us question what you’re doing, just… ever. 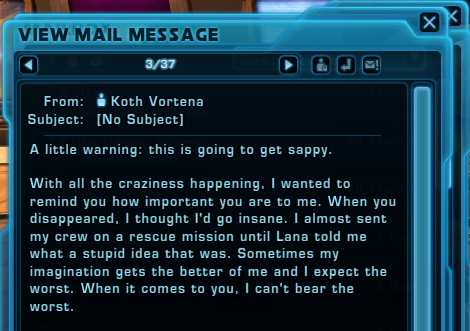 I’ve only received this letter once, on my ‘slinger. He’s hoping that when Akaavi finally shows up again she’ll gut Koth with his own goggles.